In recent years, the popularity of the Paleo diet – an eating plan modeled after the culinary habits of your Paleolithic ancestors – has skyrocketed. The primal diet, the lesser-known cousin of the Paleo diet, follows the same basic principles, but with one major twist. The primal diet allows the consumption of some dairy products, while the Paleo diet does not. The primal diet has become more of a lifestyle rather than an individual diet. The diet originated with Mark Sisson when he created the Primal Blueprint in 2009. Since then, it has grown to a lifestyle that is based on evolutionary science. Proponents of the primal diet state that since the Industrial Revolution – and the ability to process foods – the human diet has gotten way off track. The modern Western diet is full of grains, legumes, processed foods and sweeteners that your ancestors never had access to – foods that the human body was never meant to consume. The premise behind the primal diet is that the human body has not adapted to this fairly new nutritional regime, and this is the reason for the current health crisis going on in America. The primal diet focuses on consuming foods in their natural state – or as close to their natural state as possible. If a food was not available prior to the Industrial Revolution, then it is essentially off-limits. All grains; legumes -- beans, lentils, soy and peanuts -- alcohol; sugar; processed foods; and refined vegetable oils, like canola and soybean, are excluded. Instead, the diet focuses on eating plenty of fruits, vegetables, meats, fish, eggs, nuts, seeds, healthy fats and raw and fermented dairy products, like raw cheese and kefir. Natural sweeteners, like raw honey and pure maple syrup, are also permitted. Instead of requiring you to count calories or pay close attention to portion sizes, the primal diet focuses more on food quality. Wild game, like deer, elk and venison, is a preferred meat source over beef because these are the types of foods that your hunter-gather ancestors would have had access to. 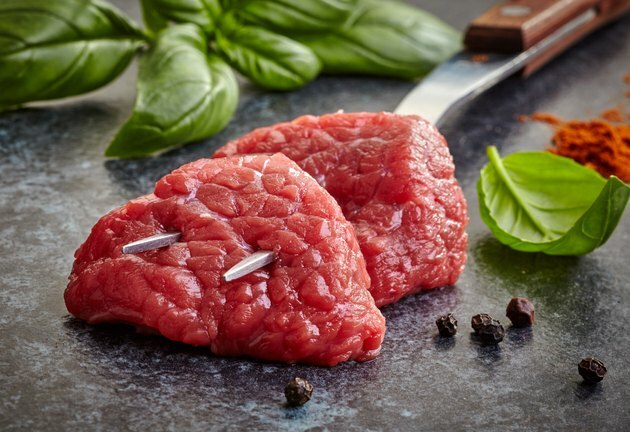 When choosing meats, the primal diet encourages grass-fed and organic over conventional. Organic fruits, veggies and eggs are also preferred. Although the diet is modeled after the habits of those who roamed the earth in the hunter-gatherer days, its followers don’t expect you to ditch the oven and start cooking your food over an open fire. For example, the diet allows coffee, seltzer water -- with no added sweeteners -- and some packaged foods, as long as the ingredients are consistent with the plan’s basic principles. A typical day on a primal diet may look something like this: You have a black cup of coffee in the morning, along with a couple of eggs scrambled with spinach and zucchini and topped with avocado. Your mid-morning snack consists of a handful of almonds and shaved coconut, and lunch comprises a mixed green salad topped with chicken, olives, sunflower seeds, chopped apples and olive oil-and-vinegar dressing. Your afternoon snack might be celery with cashew or almond butter on top. A typical dinner consists of broiled fish or steak with a baked sweet potato and a side of broccoli tossed in olive oil and salt. Although the premise behind following a primal diet is a good one, the jury is still out on whether this way of eating actually has proven health benefits. One study published in the journal, Cardiovascular Diabetology, in 2009 reported that following a Paleolithic-style diet improved glycemic control and several cardiovascular risk factors in patients with Type 2 diabetes. Another study in the European Journal of Clinical Nutrition, also published in 2009, reported that following a hunter-gatherer type meal plan improves blood pressure and total cholesterol, LDL cholesterol and triglyceride levels in healthy sedentary people, even without weight loss. However, several other studies measuring these same markers have reported results that are statistically insignificant. Leslie Bonci, a registered dietitian, licensed nutritionist and the director of Sports Nutrition at the University of Pittsburgh Medical Center says that some of the benefits of a Primal diet include eating clean, unprocessed foods with no additives or preservatives and getting an anti-inflammatory benefit from eating lots of fruits, vegetables, oils, nuts and seeds. She also lists some cons, which include avoiding grains, legumes and beans, which provide fiber, energy and vitamins and minerals.